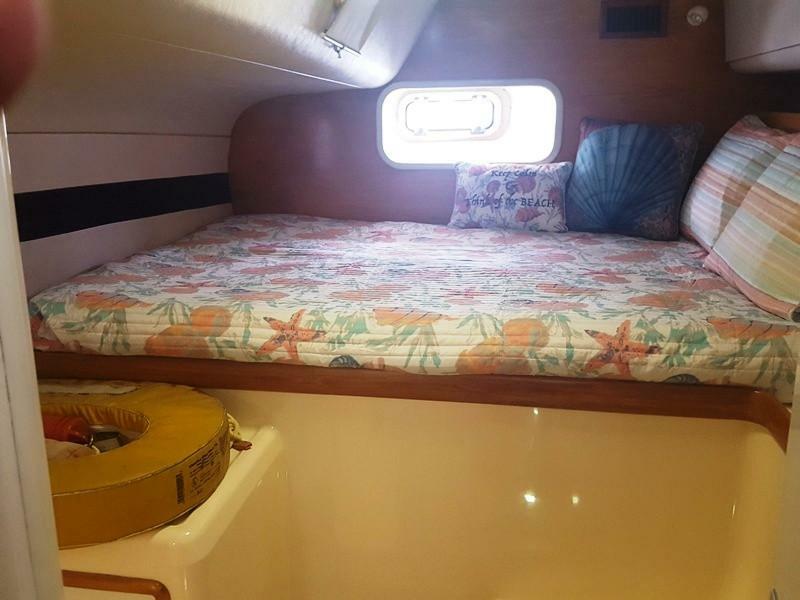 4 STATEROOM / 4 HEAD SAIL CATAMARAN ….. 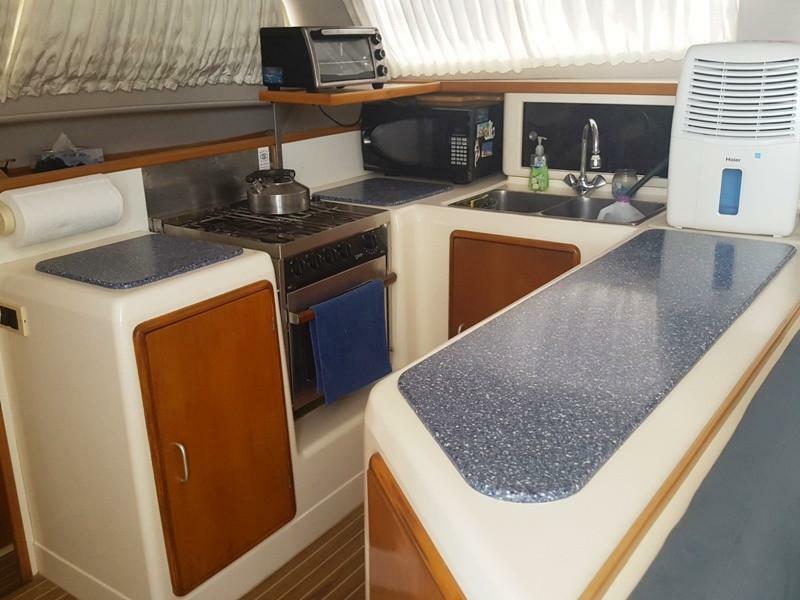 Very nice and clean 45′ Robertson & Caine Leopard 45.
this vessel has it all !!! 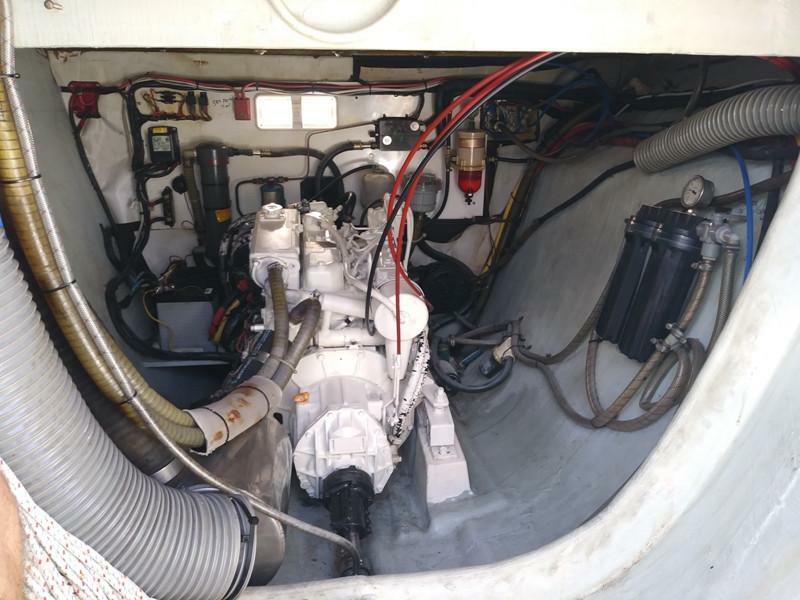 Digital Radome, C-11 Auto Pilot and much more. (2) NEW Yanmar Engine Control Panels in 2018. 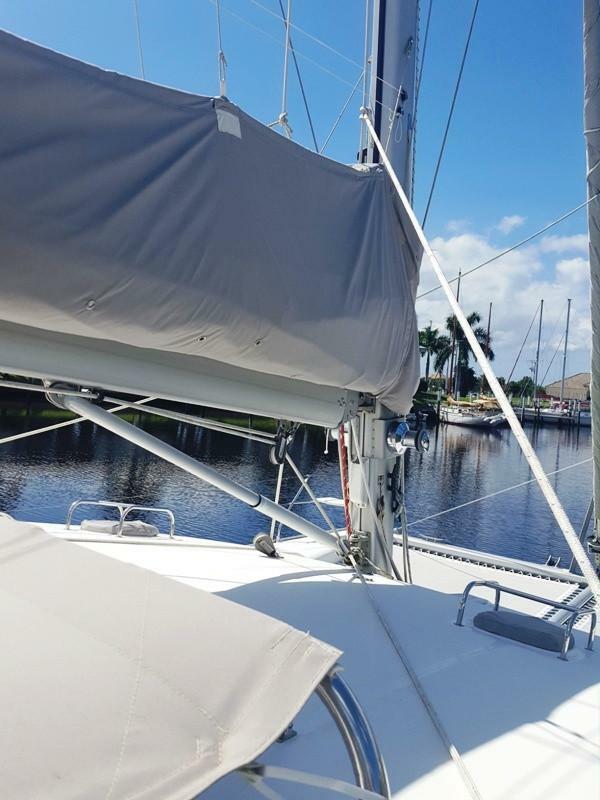 Sails and Rigging inspected and serviced July 2018. 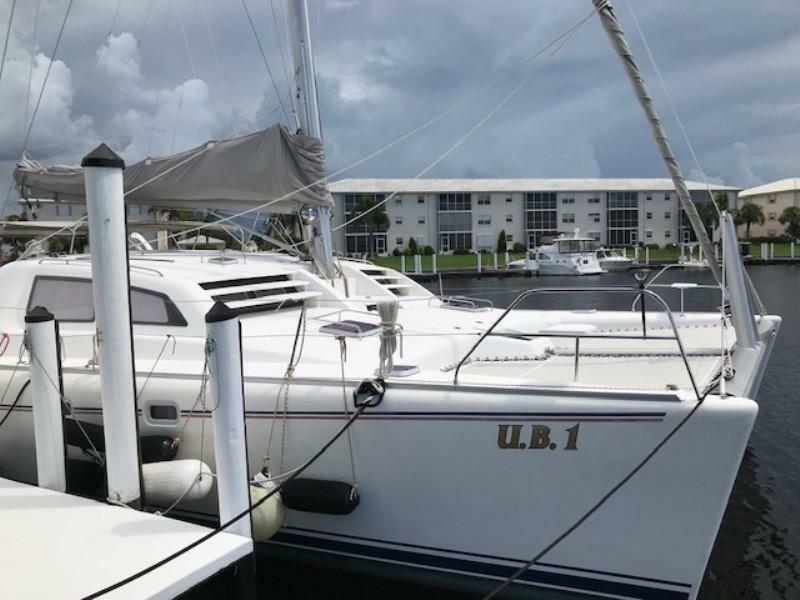 Includes 10′ Hard Bottom Dinghy with 25hp Yamaha Motor. BE SEEN TO BE APPRECIATED !! 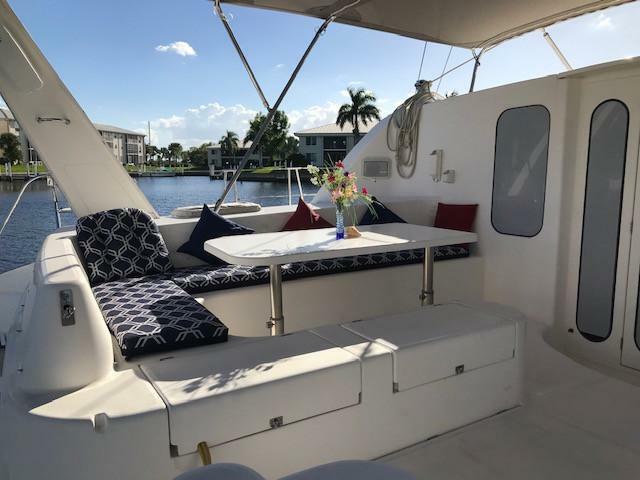 This cruising vessel with (4) Stateroom / (4) Head layout has a wide open living area with Salon / Dinette, Nav Station and fully equipped Galley. 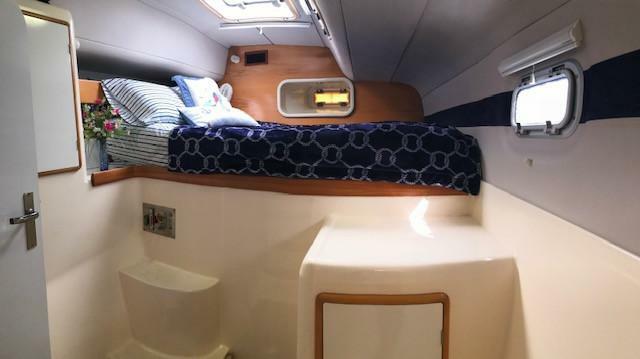 Comfortable sleeping quarters are private with fore and aft Cabins which include en-suite Heads. LED Lights throughout main living area (NEW 2018). 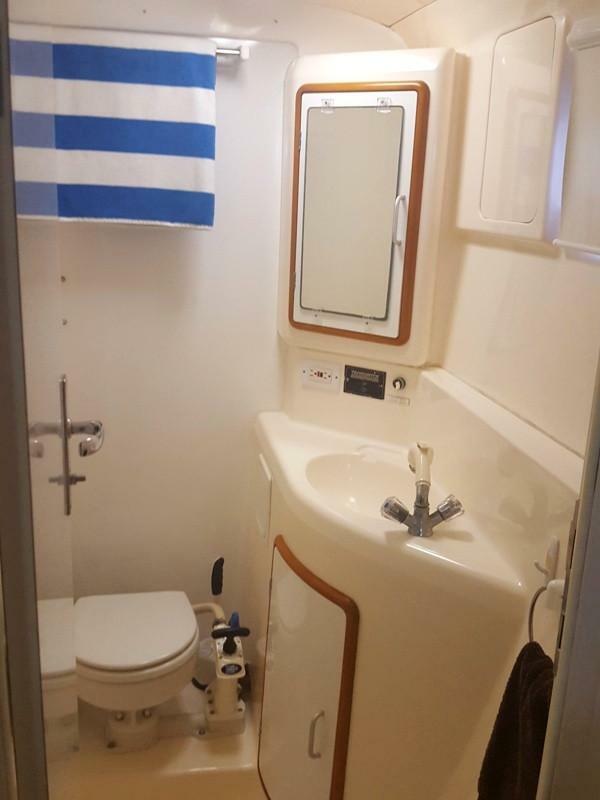 Fully air conditioned in main living area and Cabins. Fans in main living area and each Cabin. 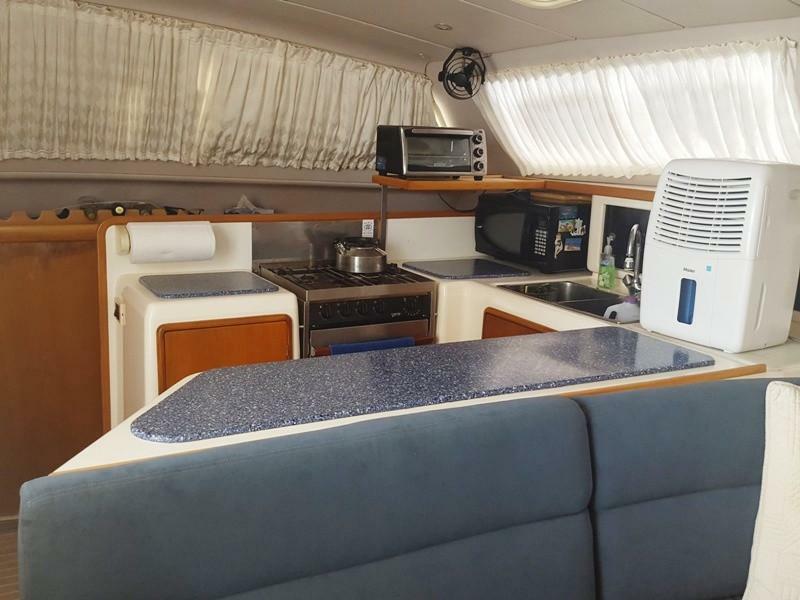 The Salon / Dinette is open and to the right of the Galley. 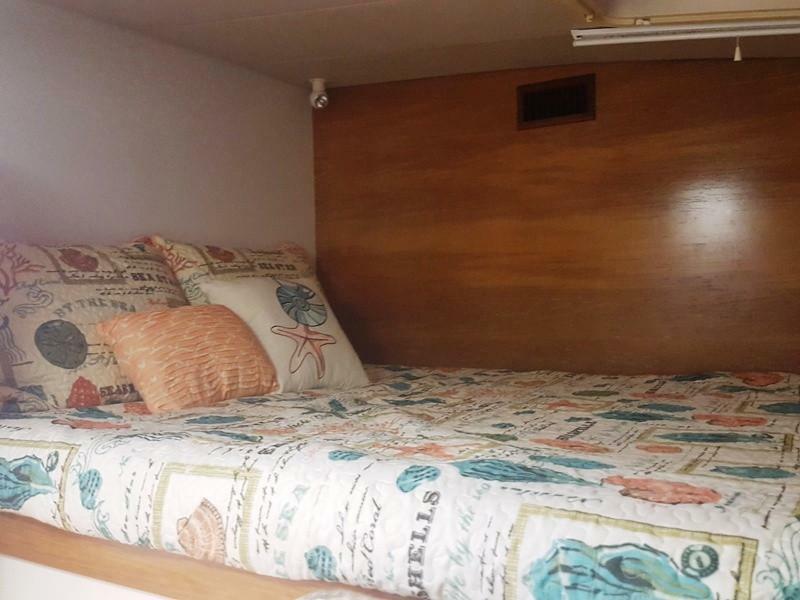 U-shaped upholstered seating for eight to ten, converts to king-size sleeper. Oval adjustable table for dining and entertaining. Axess 32” flat screen TV (12 volt / 120 volt). Speakers (will play either in Salon or can choose to play speaker on deck). Laminate teak and holly sole. Double opening entry doors from Cockpit. L-shaped area to right of Salon entry. JVC stereo (takes USB, CD and Bluetooth) with remote. Pro Nautic 1260 P 60amp 3-bank Battery Charger with remote control (NEW 2018). 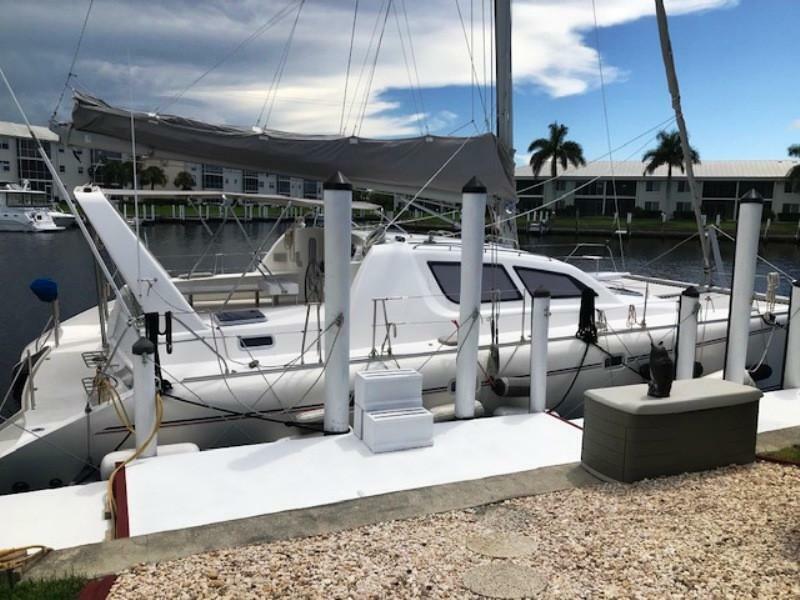 Standard Horizon 6x2200 VHF, AIS Receiver with RAM Mic / Dedicated Antenna (NEW 2018). Pro Mariner Digital Battery Charger. 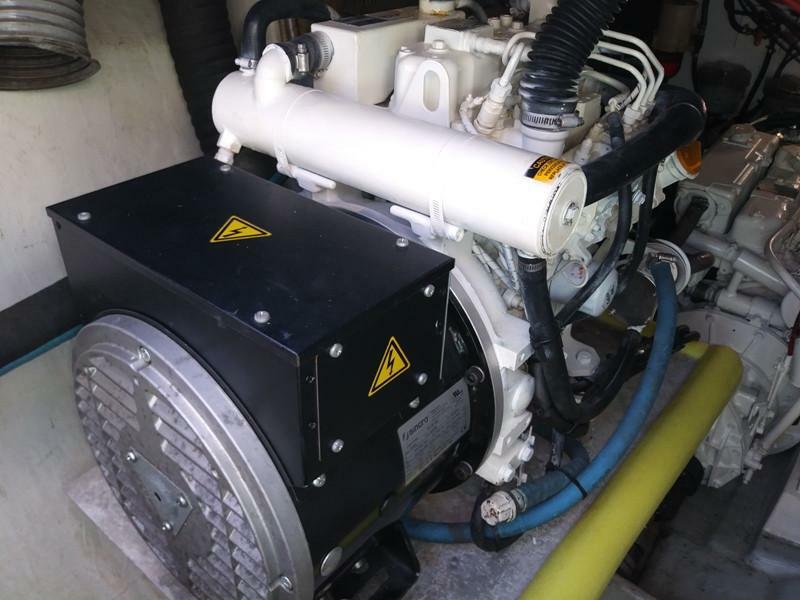 (2) Electromaax 215 AMP Alternators with External Control and Regulators Prof. (Rewired with large cables and fuses, Serpentine Belt System (2018)). 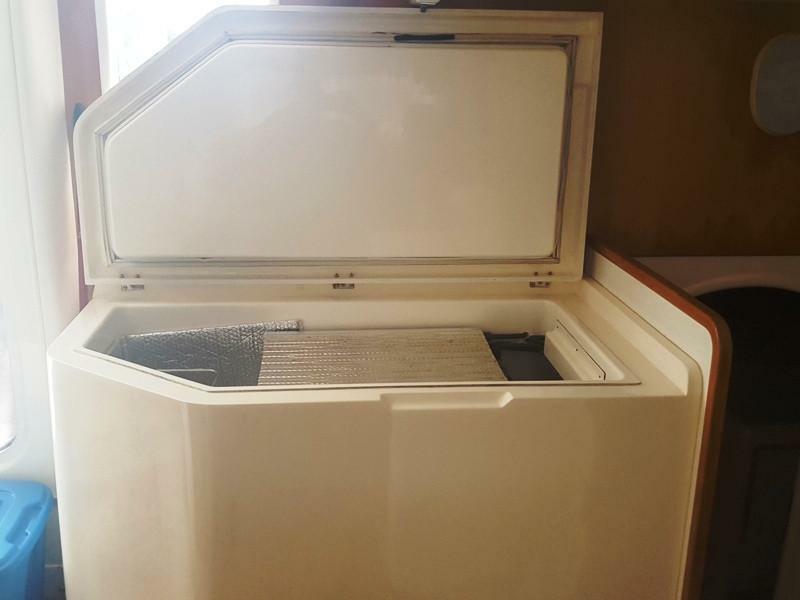 Seafrost full-size refrigerator / freezer chest (engine driven coldplate refrigeration system with 120 volt shore assist unit). Force 10 (4) burner propane gas stove with oven ((2) 10 gallon tanks, with a shut off solenoid). Hamilton Beach 900 watt microwave oven. Black & Decker Toaster oven. Lots of counter space with solid surface inserts. Full set of dishes, pots, cutlery. 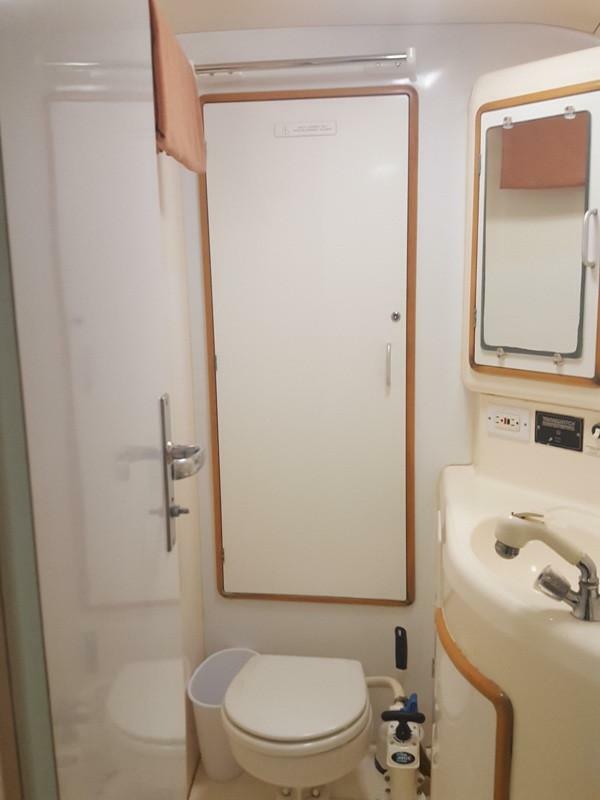 (4) Cabins with identical features and Ensuite Heads. 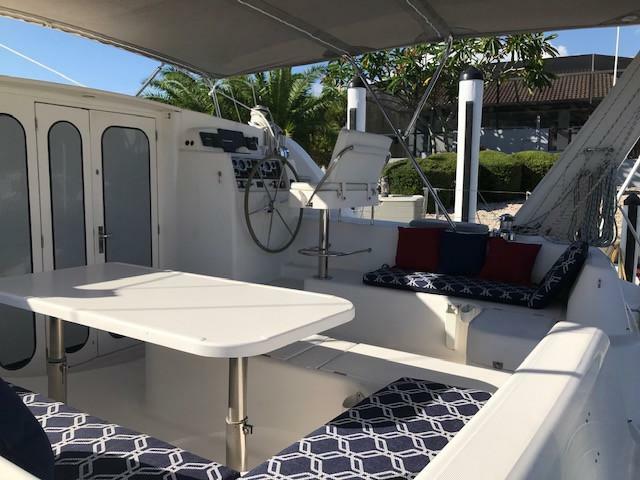 Forward and aft Port Side Cabins with companionway in between. 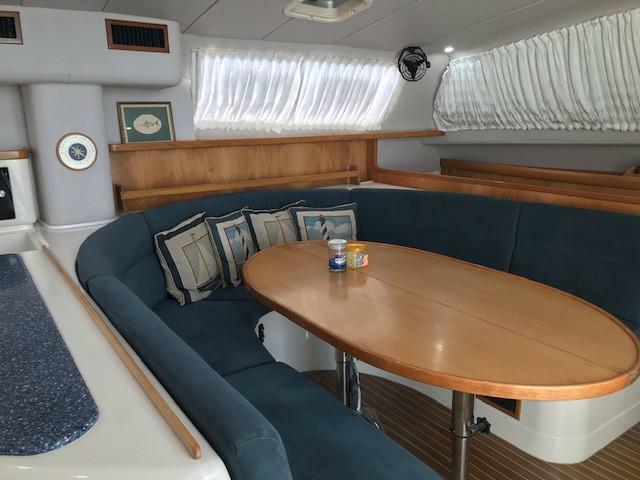 Forward and aft Starboard Side Cabins with companionway in between. 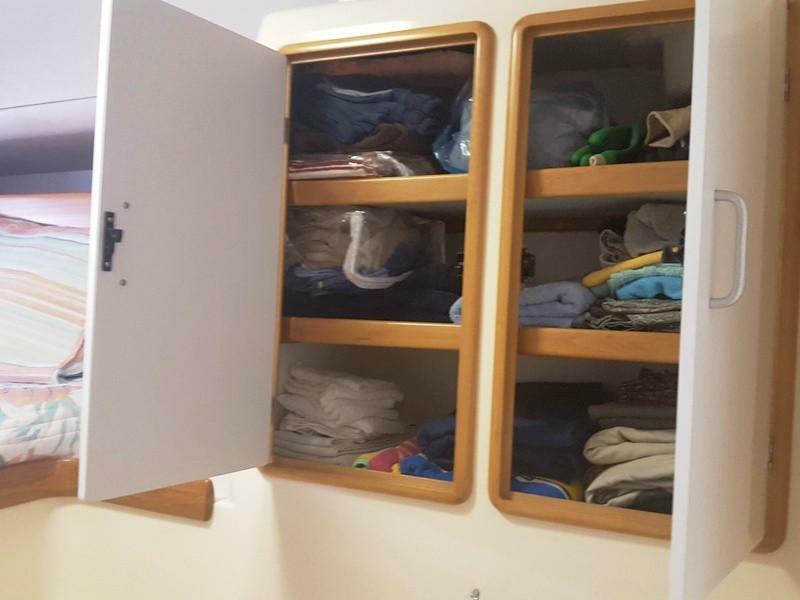 (2) upper side-by-side cabinets with shelving. 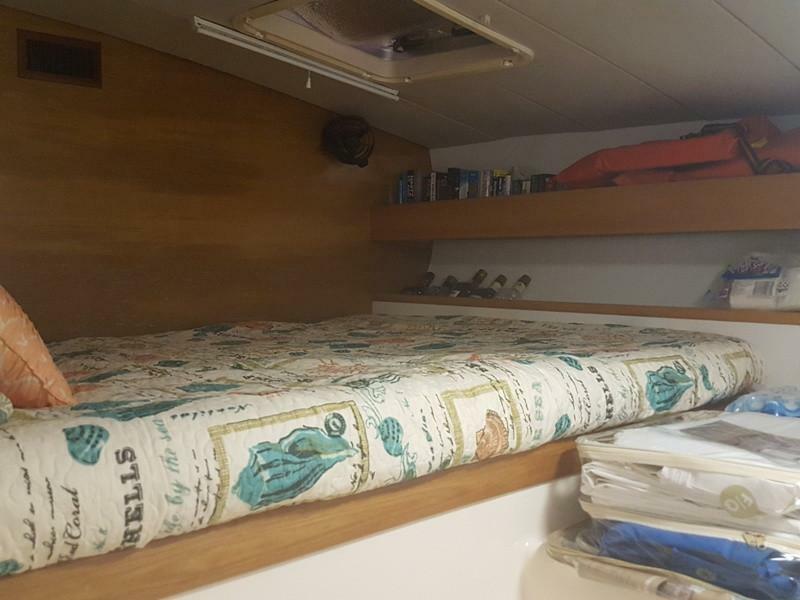 Full bedding for each Cabin: queen mattress cover and fitted and regular sheet, (2) pillows with cases, comforter and decorative pillows. 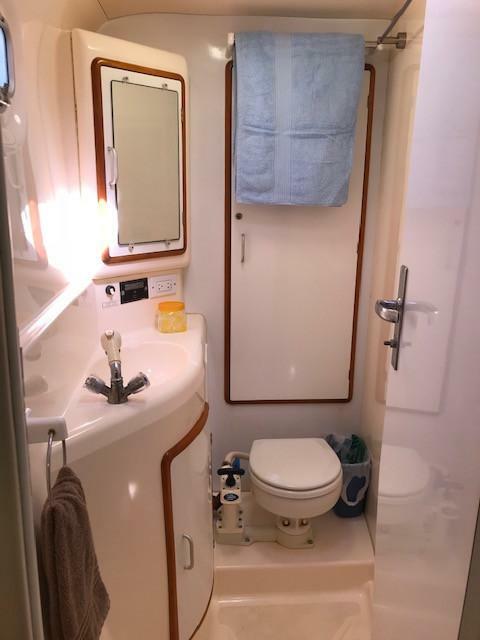 Molded vanity with sink and faucet and storage below. Furuno TZTL12F Touch Navnet Plotter, Sounder, Radar with remote control. Furuno DRS4DL+ 4kw Digital 18” Radome. Furuno Nav Pilot 711 C Auto Pilot. Furuno 220WX Ultrasonic Wind/Weather Sensor. (2) Furuno FI-70 instruments, Data Organizer, Wind Display. 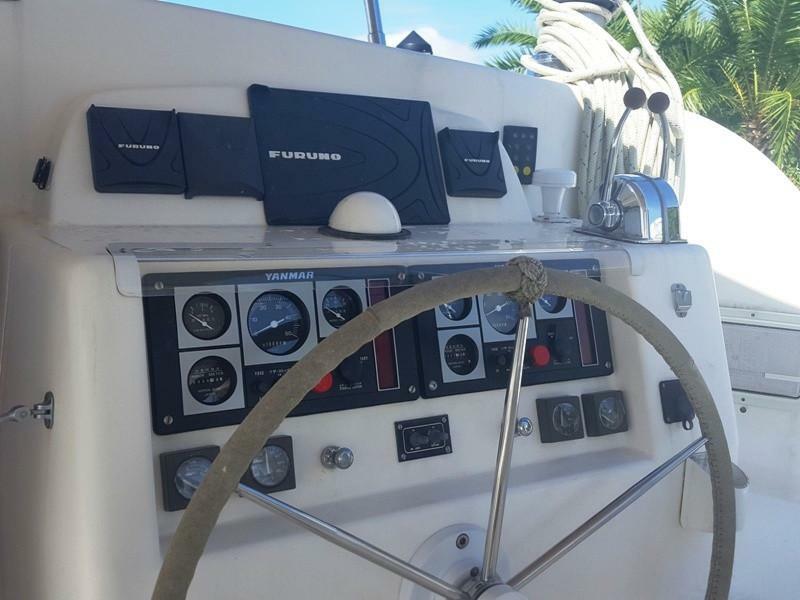 Furuno In Hull Depth Transducer. 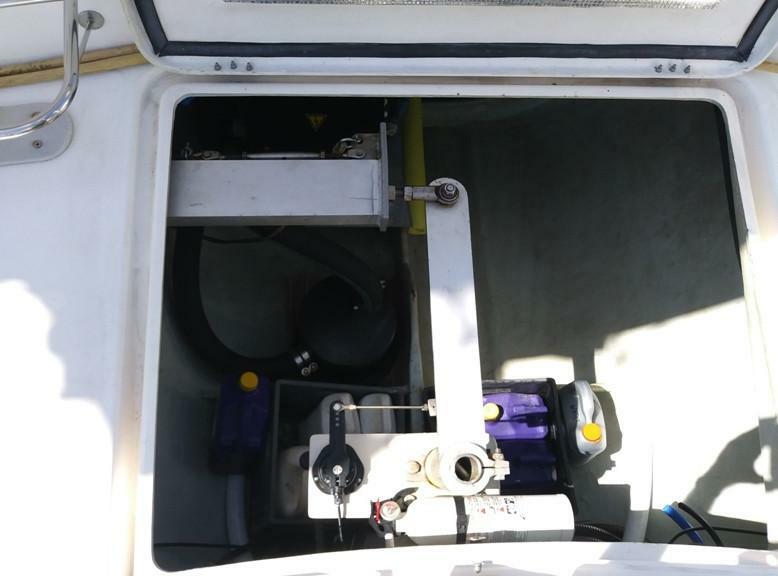 Furuno Bottom Mounted Depth, Temperature Transducer. Wide Link B600 AIS Class B Transponder SOTDMA with WiFi dedicated Antenna and (2) GPS Antennas. Wirie Pro+ WiFi receiver with GPS and cellular booster. Charger Inverter Xantrex Freedom 2000W/55Amp with remote control. New Digital charts for Eastern/Southern US, Caribbean and Bermuda, Mexico, South America. 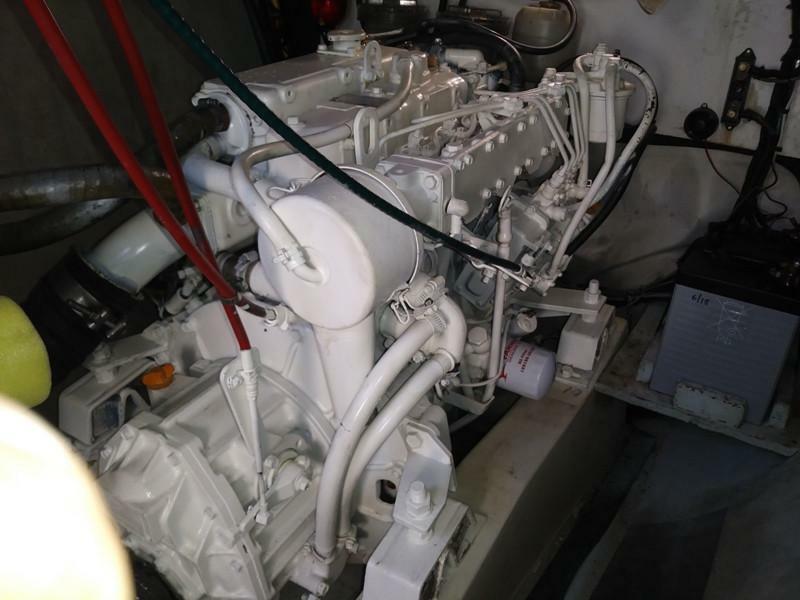 Norpro/Yanmar 9kW Generator (2,347 hours) with generator end NEW 2016 with less than 50 hours. Energy controller and battery management system. (4) 4D Lifeline AGM batteries (NEW 2018). (2) Lifeline AGM Type 30 Start batteries (NEW 2018). 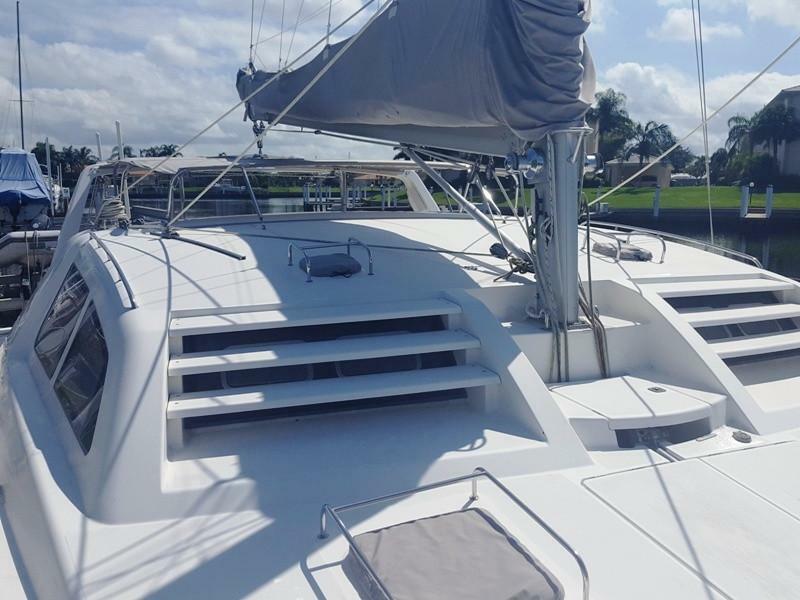 (2) Blue Seas 300amp ACR Controllers (NEW 2018). (1) Xantrex Link-Pro Battery Monitor (2018). 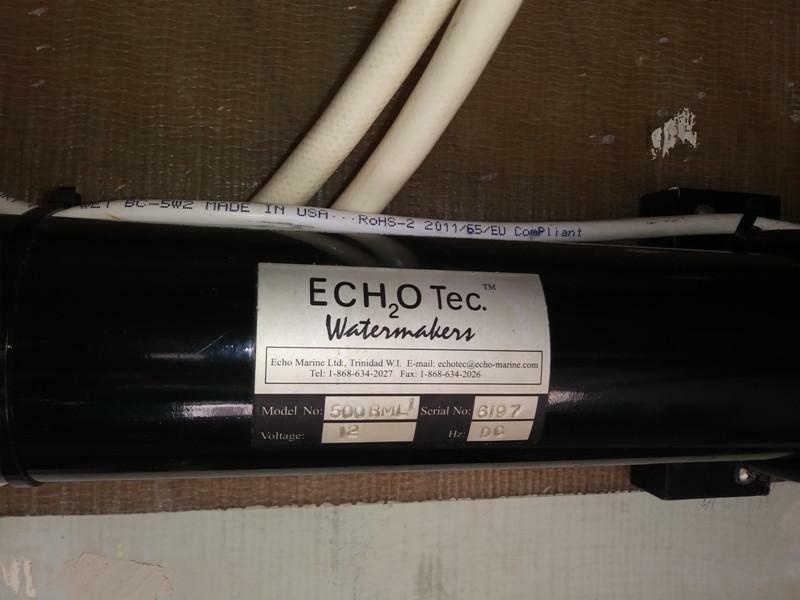 ECH2O Tec. 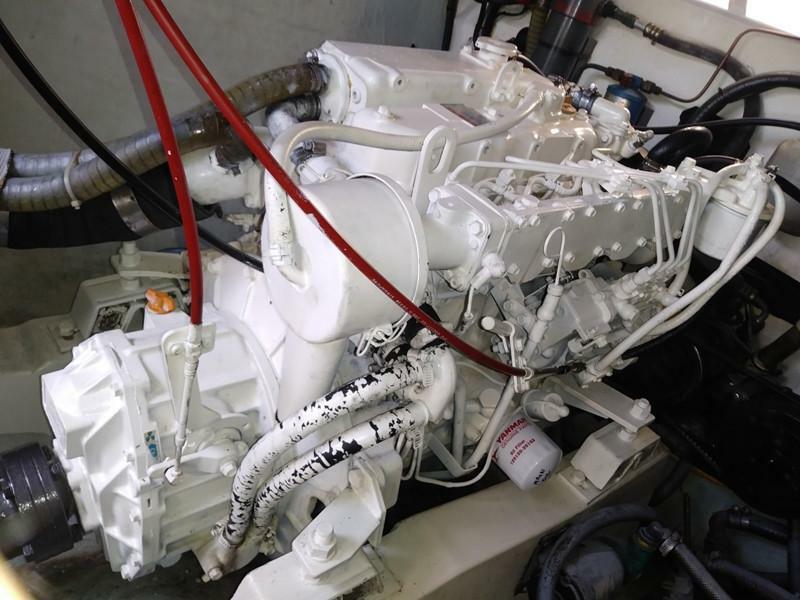 20 GPH Engine Driven Watermaker. 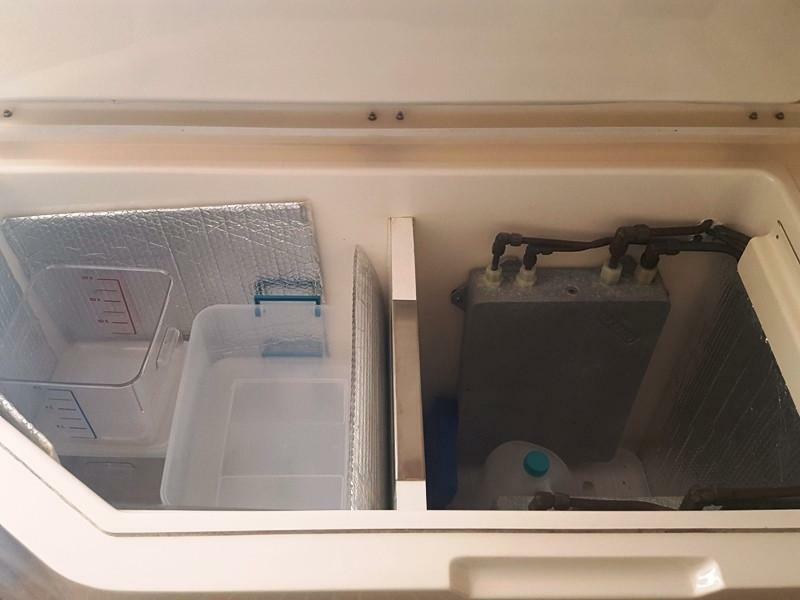 (3) Water tanks: (2) 80 gallons tanks and (1) 50 gallon tank (210 gallons total). 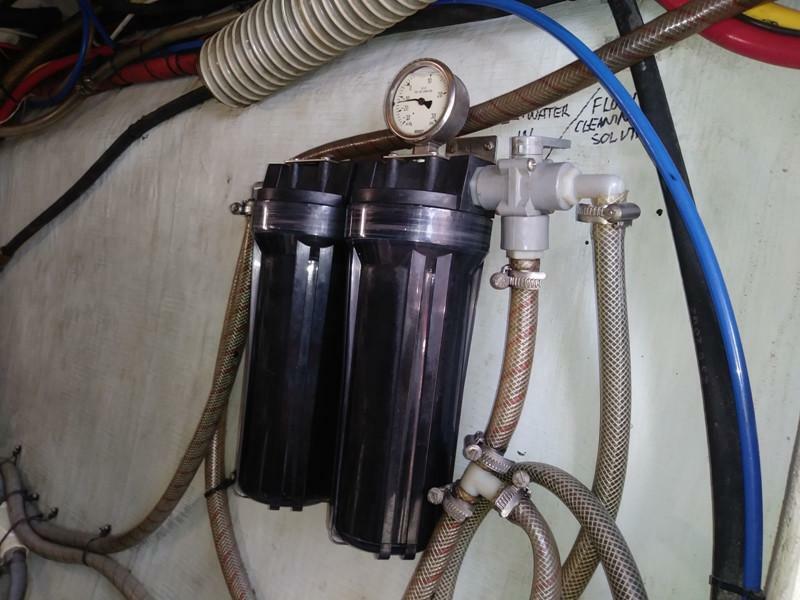 (2) 30 gallon Black water tanks (60 gallons total). 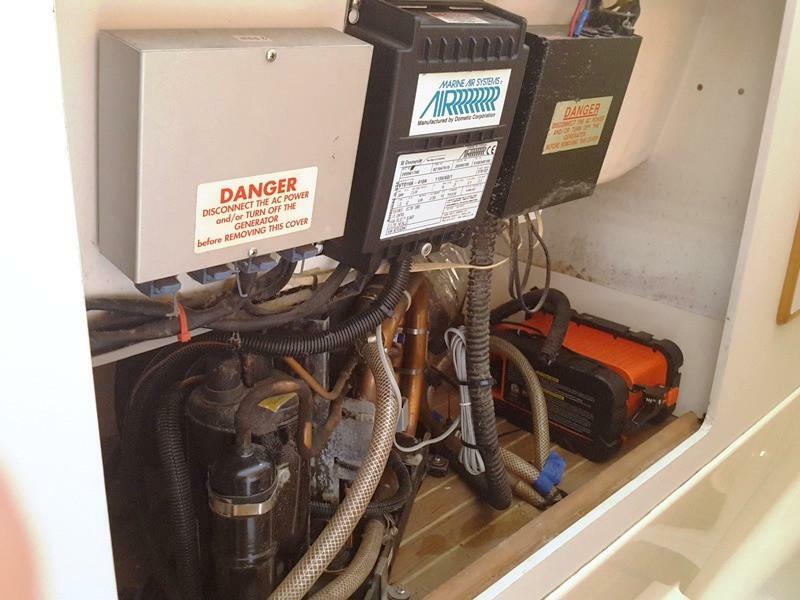 (4) Rule 2000 Bilge Pumps. (2) Atwood 120 volt 11 gallon Water Heaters (2017) (Water Heaters and Accumulator are Stainless Steel). 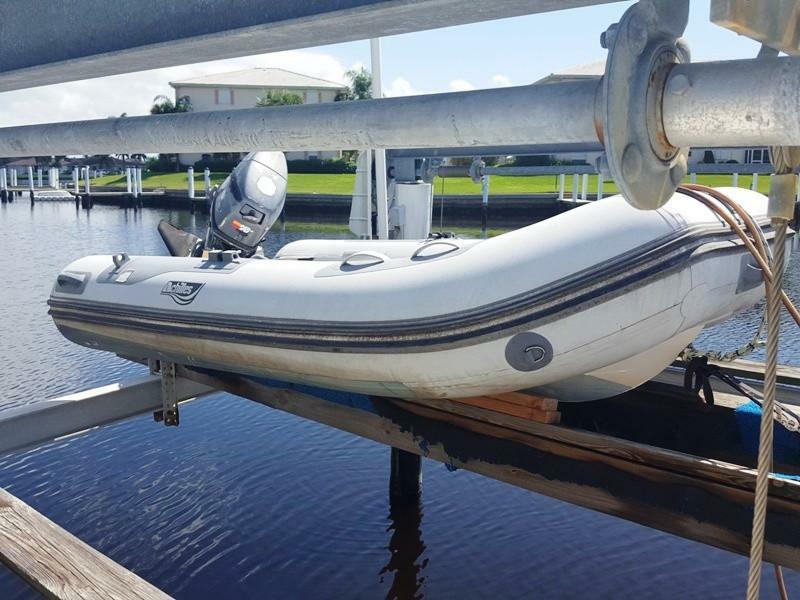 Includes 2012 10’ Achilles Hard bottom Dinghy with 25 hp Yamaha Enduro 2-stroke engine. 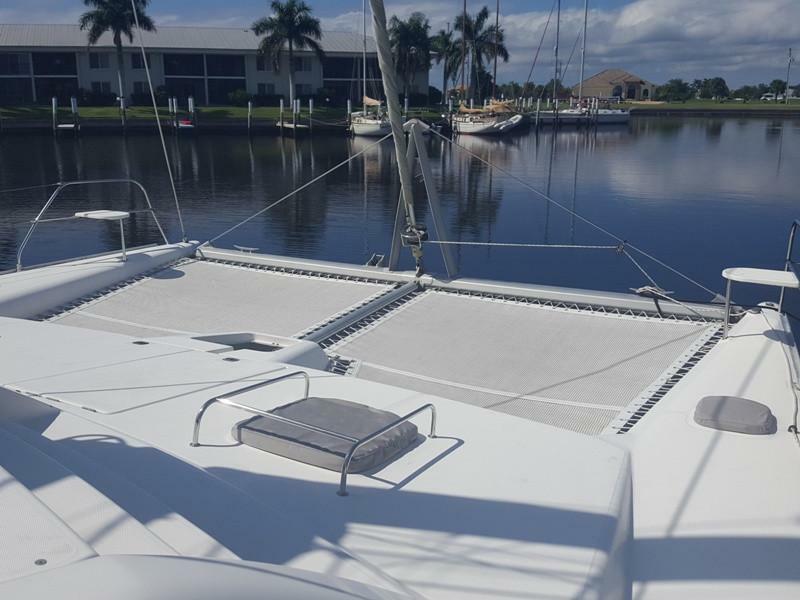 Bimini Sunbrella Cadet Grey with zip-on vinyl windshield (NEW 2017). 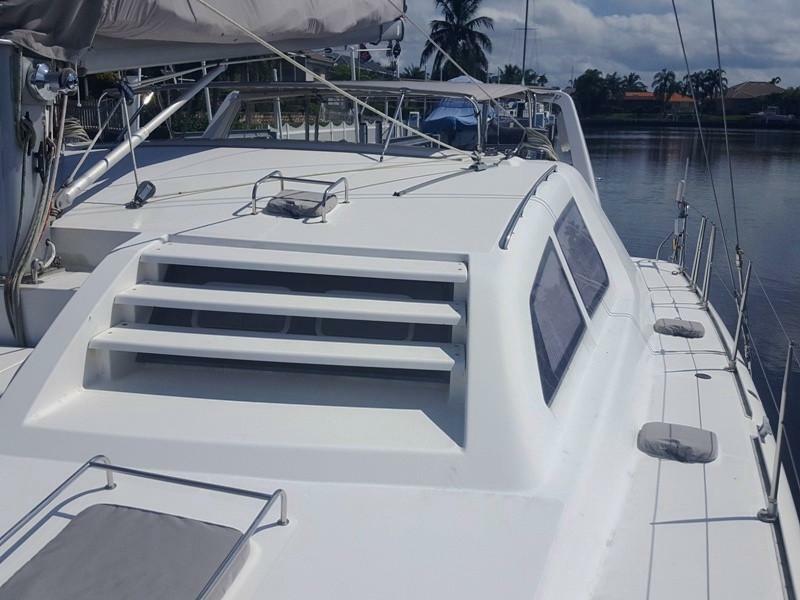 White sun shade for back deck (NEW 2018) (spare set in blue). Vinyl 3-panel sun shade enclosure (2017). 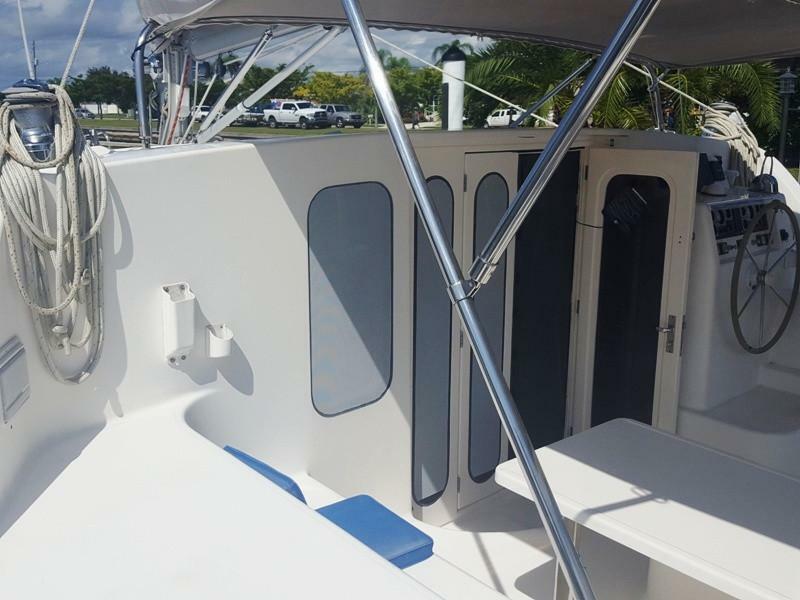 Sunvisors on transom port windows (NEW). Double Helmseat with updated seat (2018). 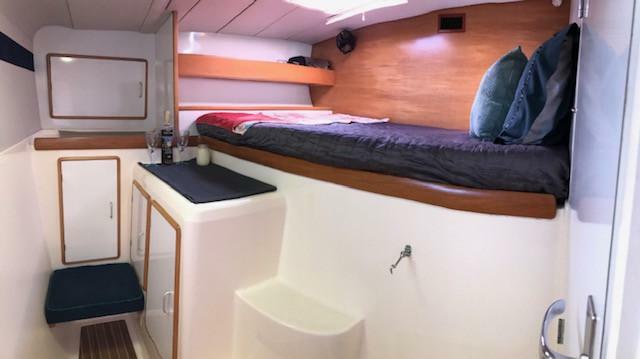 Wraparound Cockpit seating with storage. Adjustable deck table with leaf extender able to seat (10). (2) Bose 151 Cockpit speakers. Color changeable LED lights in the Cockpit (NEW 2018). 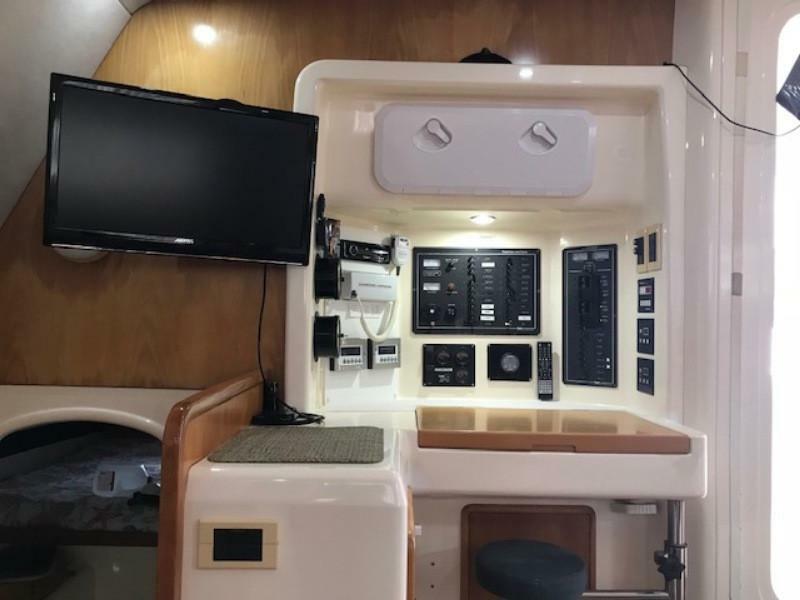 LED Aqua signal Deck Lights and NAV Lights (NEW 2018). 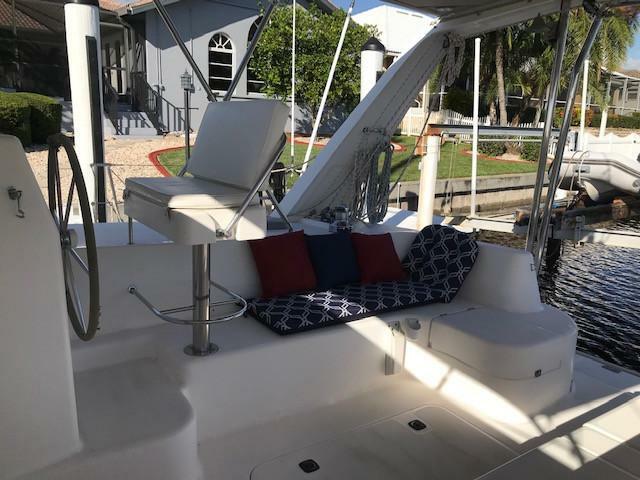 Perch seats on bow rails port and strboard. 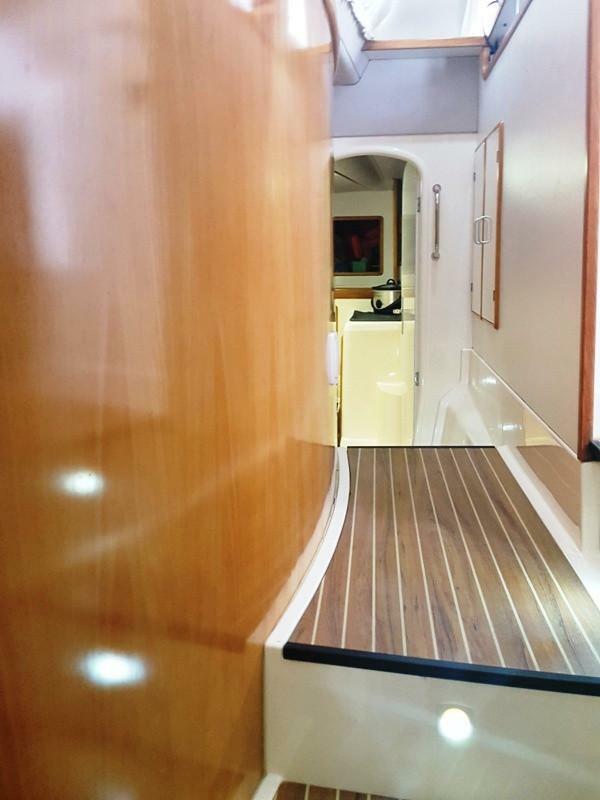 Aft swim platform and molded stairs port and starboard. 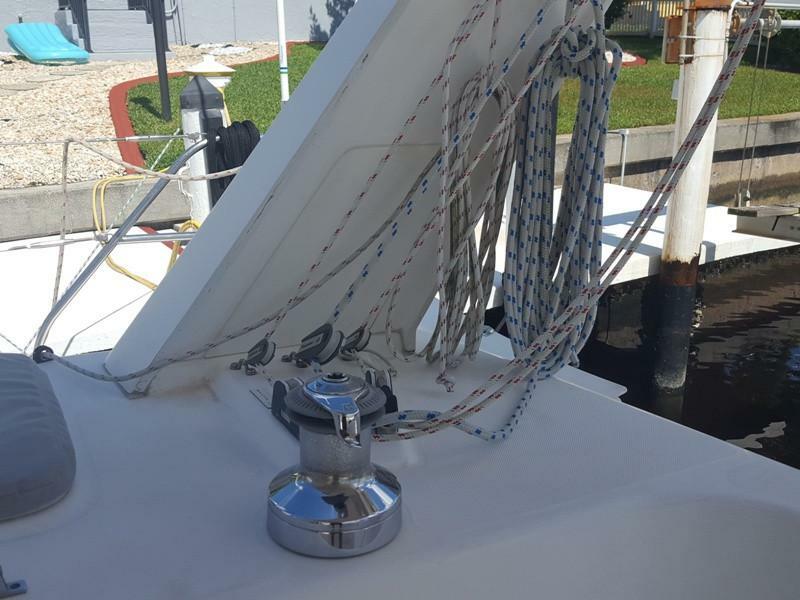 Stainless steel folding davits on transom. Magma BBQ and (4) propane tanks, (2) small. Lewmar Tigres Windlass 1200 watt (2018). 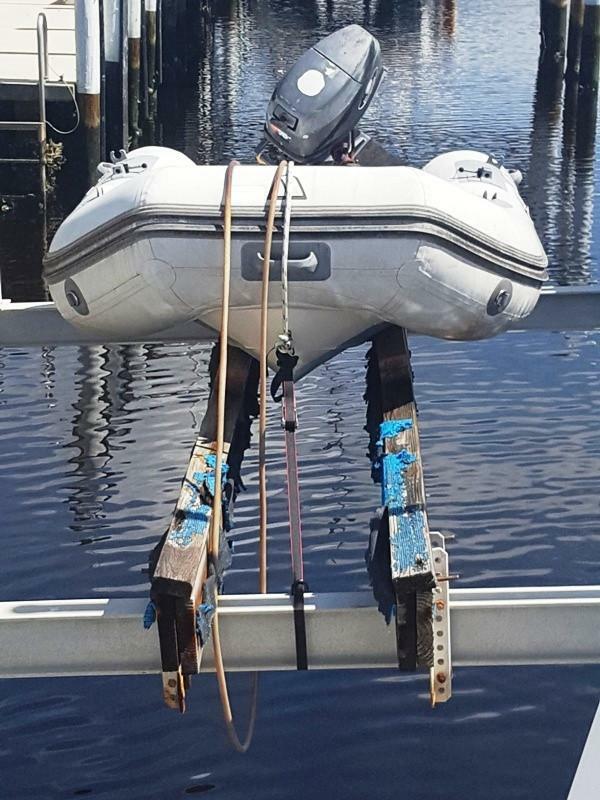 (3) Boat anchors; 300 feet 3/8 galvanized chain. 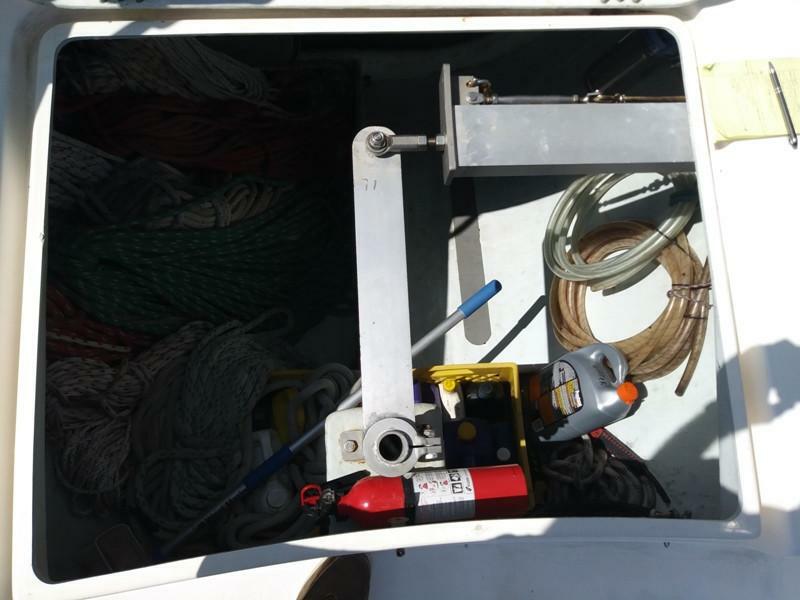 (1) Anchor for the dinghy (extra anchors are only back up). All lines in excellent condition. Fire extinguishers, safety kit and flares. (2) Fishing rod holders and Magma cutting board. Lots of fenders and extra lines for docking. 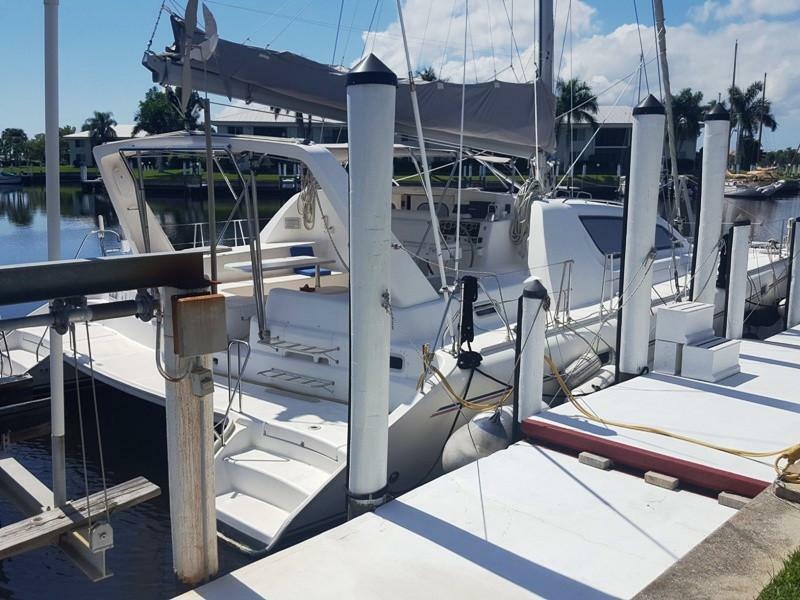 RIG Inspection: Taken Down, Inspected in July 2018 and reported in “good condition”. 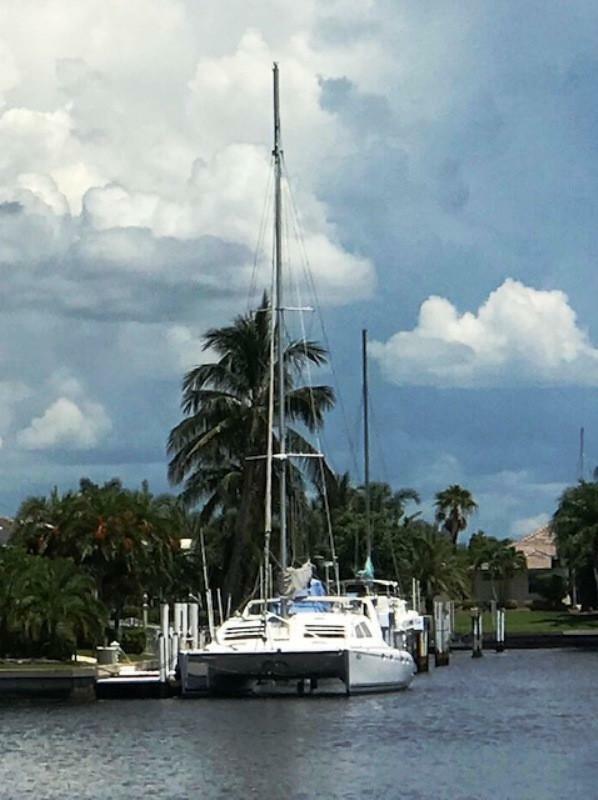 Quantum Main sail (2003) with stack pack and lazy jacks. Sunbrella Cadet Grey Sail Bag (NEW 2018). 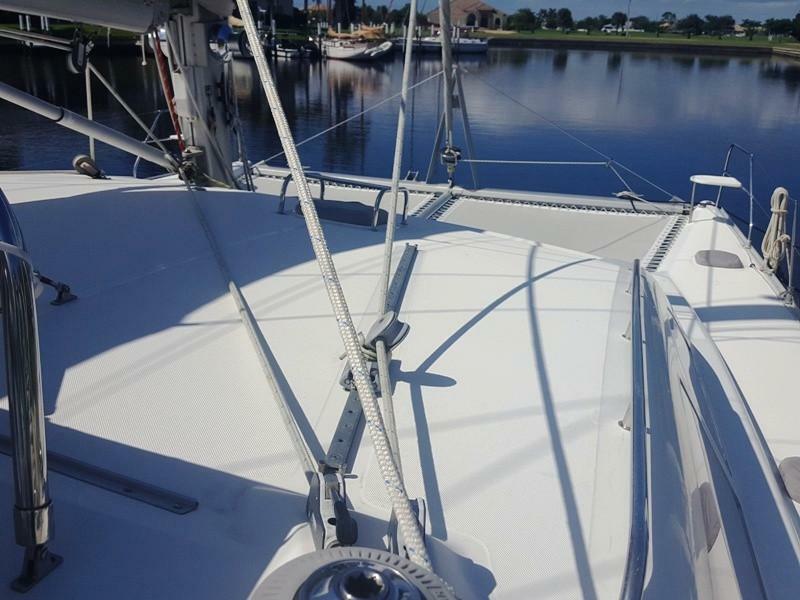 (2) Lewmar 54ST 2-speed main sail and head sail winches. 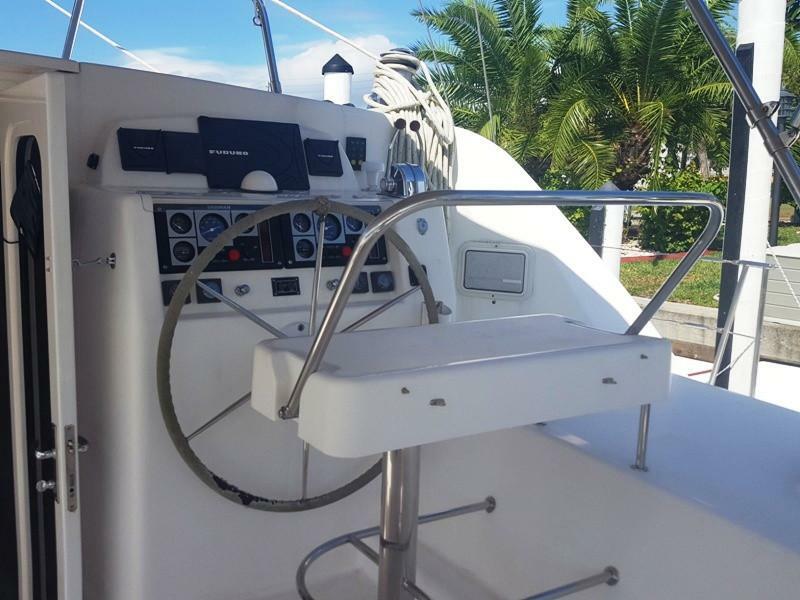 Lewmar 44ST 2-speed traveler and davit winch. (2) 80 gallon Fuel tanks (160 gallons total). 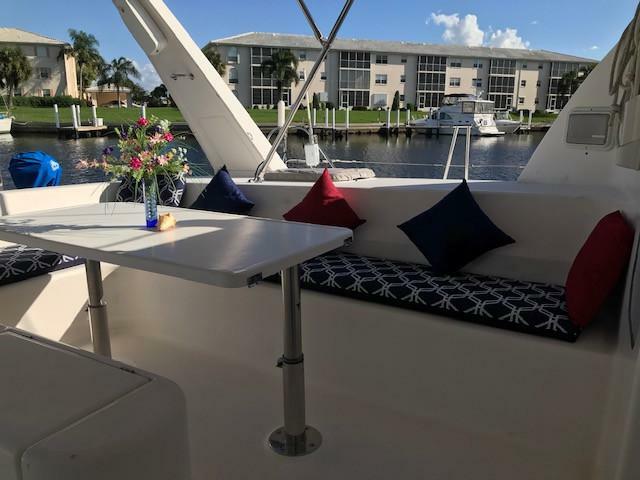 (2) Dometic/Cruise Air 120volt air conditioning systems: (1) 16,000 BTU (2013); (1) 10,000 BTU (2018) - (Air runs to each cabin and through the living space). (2) Reconditioned Maxi Prop Wheels (2017). (2) Yanmar Engine Control Panels (NEW 2018). Feathering Maxi-Props and (2) spare Maxi-Props. 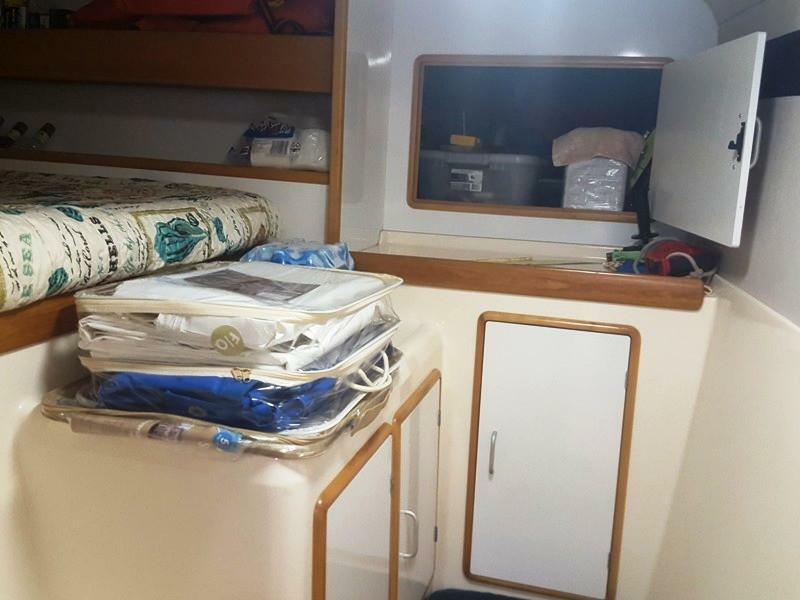 Lots of spare parts such as seals, belts, extra water pump, back up toilet pumps and (2) back up bilge pumps, cleaning supplies, etc.